I’ve been feeling bad for a long time about not being able to keep up my Streetfighters project in the way I’d like to, because although Housing Market Renewal has been discontinued, the story is far from over for many of the people I’ve met along the way. There are loose ends all over the north – householders trapped in derelict streets, projects put on hold by developers amid the recession, and tussles still going on over the future of some neighbourhoods which were earmarked for clearance and decanted. I never managed to secure funding to support this project so can only follow up people’s stories on an ad hoc basis, where I have time and can afford to do so. If I could do more and do it better, I certainly would. For all the misery and blight and rifts between neighbours that clearance/regeneration plans have caused, it seems that in some neighbourhood the community spirit just won’t completely die. In some areas the attention of some remaining residents and activists is turning to the question of what happens next and how to move on from the dereliction. Some groups are coming up with creative alternatives to wide-scale demolition, and putting the plans up for public debate. Whether the relevant local authorities will actually open their minds to anything other than clearance and new build – even in the face of mounting evidence that this could be popular and cost effective – is a whole other debate. Yesterday I was in Middlesbrough, seeing a family I’m visiting as part of another project on Roma migrants. On my way home I called in to St Hilda’s, an area I covered for Streetfighters, which saw people cleansed from an estate for no apparent reason. From what local people told me back then, there had been no consultation and were few plans for the land, even before the economic crash. Few people were left in the neighbourhood last time I went there but now there is no one left at all. The only buildings still standing – other than a newish police headquarters – are a single row of terraced houses. 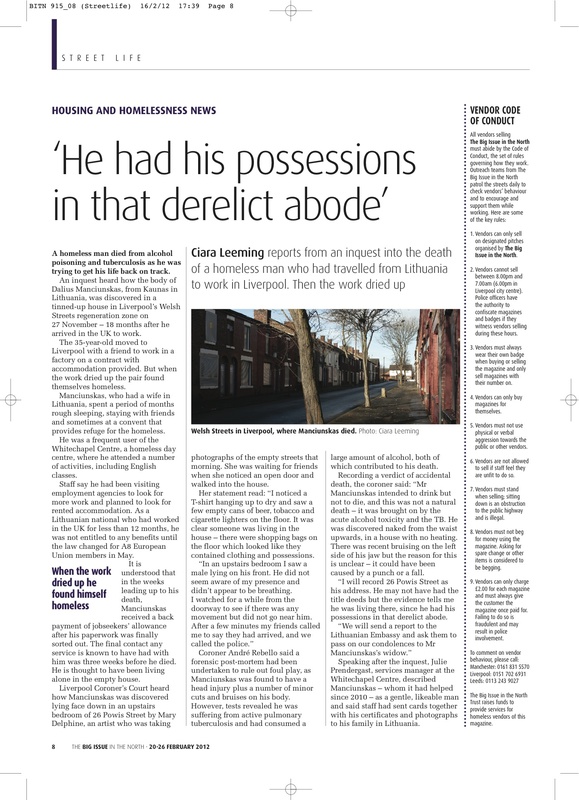 The owner of the end one – who I interviewed along with his daughter – has now died, ending a final headache for the council. I visited both spots where I had previously met occupants, just to see what was left. * It emerged after this story below went to print that even the figure of 32 houses being refurbished on the Welsh Streets may well end up being a gross overestimate. At this point it’s pretty unclear. 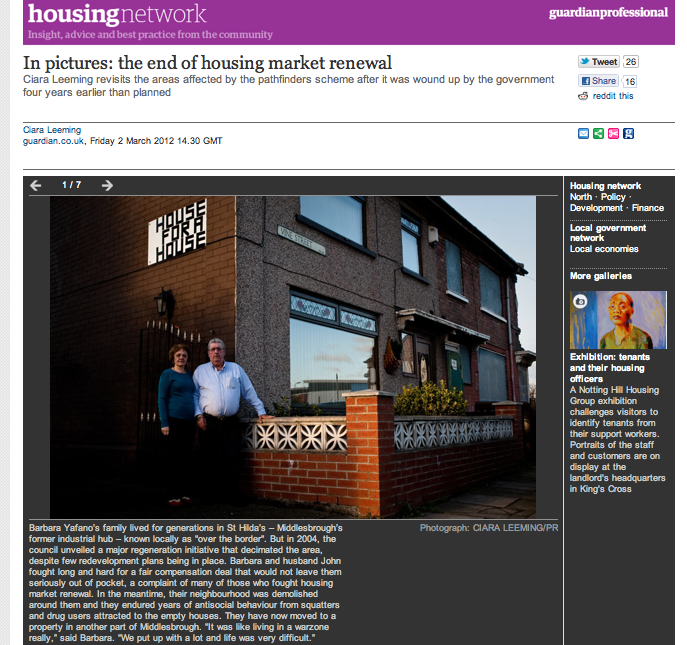 The Guardian Housing Network is aimed at professionals within the industry. This week it ran a small selection of my Streetfighters images and captions to chart the end of this controversial regeneration policy. See it here.